Turpentine Bushes (Ericameria laricifolia) are some of the last plants to bloom before the arrival of winter, and these brilliant golden-flowered shrubs are one of the few nectar sources for late season insects like these Dainty Sulphur (Nathalis iole) butterflies I observed here in late October. 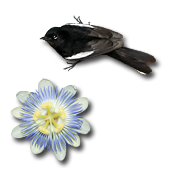 These small, yellow, black and greenish gray butterflies can be identified by the black spots on their ventral forewings. 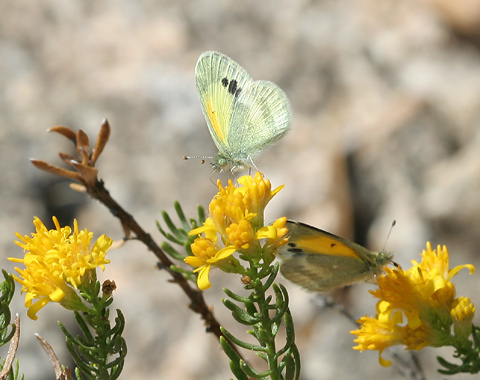 Dainty Sulphur Butterflies show seasonal variation with the summer forms having yellower ventral wing surfaces and the duller winter forms having grayer ventral wing surfaces. Dainty Sulphur Butterflies are in the Sulphur Subfamily (Coliadinae), and most of the butterflies in this subfamily are the bright yellow color of sulphur. While the Dainty Sulphur is usually yellow, a rare white form does exist. Dainty Sulphur caterpillars feed on plants in the Aster Family (Asteraceae), and some of their favorites are cultivated Marigolds (Tagetes species).